How to disable com.google.android.googlequicksearchbox:interactor ? How to disable com.google.android.googlequicksearchbox:interactor ? It is because when I want to take video, it stated that the camera is currently recording com.google.android.googlequicksearchbox:interactor. So it is annoying and I notice my handphone lately like to restart by itself. Lora Hubble and Qausara like this. I've done all the steps.. the problem persists. Please help. Which phone do you have? Have you already tried Safe Mode? I just got the Huawei P9 and have the same issue with notification pop up whenever I use my camera, Shazam, Instagram, Facebook Messenger, WhatsApp, Recorder or any application that records audio. The pop up will say for example: "Shazam is currently recording audio. 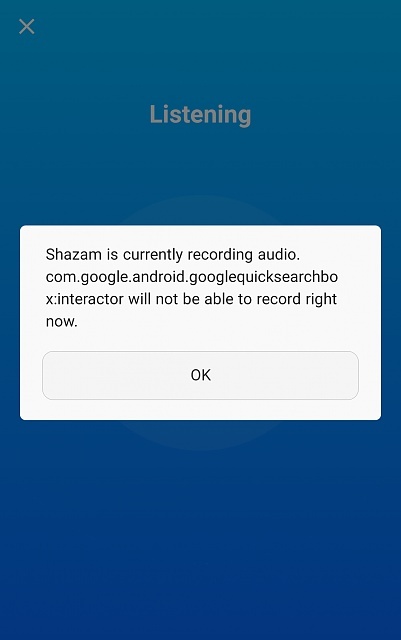 com.google.android.googlequicksearchbox:interactor will not be able to record right now." I press okay and a second later the pop up comes back, I have to press okay 3-4 times before the notification pop ups stop appearing on my screen. The applications still record audio and video while this happens but it is extremely annoying and blocks half my screen while I'm trying to record. There must be a way to stop these notifications without disabling Google App. I use Google App for voice searches ("OK Google') on a regular basis and disabling the application does not help.. I need to stop these pop ups from appearing all together. I've already tried clearing caches by rebooting (power off phone, press and hold down Power On/Off buttom and Volume Up button together for 15-20 seconds, use Volume Down button to go down to Reboot and press Power On/Off buttom to select.... This did nothing to resolve the issue. Hi there. I've had this problem since I got my Huawei Mate9 Pro some five weeks ago, and I have tried all the steps I could find online. Nothing worked. The various Android errors related to googlequicksearchbox seem to be related to "OK Google" voice activation. Go to Apps in settings, go to the app labeled simply "Google" (not google voice) and find the settings. TURN OFF "OK Google" setting (this never worked very well for me anyway!) and including in "Maps". Then clear caches, use "phone manager" to clean up all the junk and caches you don't need and reboot phone. This did it for me! Now video works, Square works YAY! Be careful - my Android keeps offering - several times per day - to turn Google Voice settings back on! A careless finger swipe can do this accidentally - so if this shows up again, repeat the above steps. Under this... Disable the permission called "HiVoice"
^ Several posters in this thread have helped. How to listen to music on gear s2 ? What type of android smartphone is built for good graphics? How do you save photos on a android ZTE?